Yesterday about 20 of us met at a Subway restaurant to what is termed a “Nerd Dinner”. It started with an event page created on Facebook to which I got an invite. I happened to be around that area conducting a workshop. So I decided to drop in and check it out. It was a great gathering. About 20 of us jabbering on various tech topics and wide ranging discussions. It was kind of free for all and very energetic for a while. So I decided to create a group so that we can continue the discussions. This time instead of the usual Google groups, we thought of trying a Facebook group. This morning I created a group, added about 5 key members who are very active in tech community and made them all administrators. I was not prepared for what happened next. In a mere 8 hours after my initial creation, there were 199 people in the group. We got so excited, we started posting a lot and that probably turned off a bunch of people so a few dropped out. Even then, the count stands at about 194 now. I need to study the facebook group phenomenon a bit more closely. This never happened to any groups I created before. If you want to check it out here is Nerd Dinner Chennai. What is technology intelligence? Do you have it? Do you need it? Why? I wrote down a few observations and thoughts. Technology Intelligence is the ability to look at developments in technology and use them as enablers. You can map a new technology development to something you do in your organization. This may be a new product design, a new extension to an existing product, a service design, a new way of marketing, a better way to obtain sales leads, a simpler method of manufacturing etc. There are no bounds. Technology Intelligence is needed for almost every organization. Organizations in certain industries may need it more than others. If you have it, you will certainly have some competitive advantage over others, who don’t. Each new development in technology creates at least one marketplace which may over time blossom into multiple markets and an entire industry. When it appears, a new technology may not appear earth shattering. So people tend to ignore it. There will be a series of minor shifts, a few scattered applications and all of a sudden, there will be some company getting millions of customers. Don’t look to journalists to cover it (unless they are some one like Jon Udell). Some times a simple technology may go viral with great impact. Twitter is a good example. It started as an innocuous micro-blog. It was ignored by most in the beginning. The real winners will be the ones who can find new applications for a technology and successfully implement it and educate others. Leveraging technology is a special skill. It can be acquired. Detect trends early. These are also known as weak signals. First, start with an open mind. The smart ones have the ability to spot an early trend. Can you track technology, using technology? You bet. Thanks to internet and a few other factors, you can use technology to gain more technology intelligence. This process is called tech mining. That is what we do for a living. Posted on October 22, 2010 Categories Emerging Technologies, Ideas, Creativity, Innovation3 Comments on What is Technology Intelligence? Every organization needs to keep track of information about a set of entities. For a business, these may be customers, partners or competitors. It may also be items related to the marketplace, industry sector(s) and related industries. Here is a simple mind map of a few things I can think about. This is just a starting point. (if you need a copy of this mindmap in pdf format you can get it here). Do you have a strategy to gather information and use it? How do you do it today? I found a formal Ontology Specification for Organization and Registered Organization (attempts at standardizing organization meta data). Here is a picture from the Organization Ontology. A schema for an Organization is available here. If you are an Ontologist, modeler or software developer, you may also be interested in a more generic discussion of the data model. I use Twitter more than anything else nowadays. More than any other social media – facebook, linkedin, Google Reader, Wikis, Social bookmarks or even podcasts. I use all these, but the links actually seem to generate from the tweets I read. Twitter is my quick environmental scanner. Twitter stream brings me nuggets of news, opinions, humor and recommendations. Why it is even my medium for mini-conversations and a source of discovering some cool people and products. This wish list is really me thinking aloud. Some of them may be Twitter enhancements. Others may come from Twitter clients. 1. I get follow notifications by email. So I would love to see an email plug-in (Gmail preferably) that provides a tag cloud of the recent tweets by the person who follows me. And an interface to follow right there and add them to one of my lists would be a bonus. 2. I would love to consume tweets by email (that way I have one universal client) but many people may not really like this. If it comes to email, I can do some clever filing with rules. I am sure one exists. I may just need to find one that works. 3. I would love to have a twitter client or intermediary with a rule engine support. A little more powerful than the rules you find in Gmail today. There are lots of interesting possibilities here. 4. I would love to have curated.by as an email client too. In fact, Google should borrow Curated by chromium extension’s tagging functionality for Gmail. I know I am digressing a bit here. 5. I would love to get tweets in a different priority order, sorted by a retweet count (from my friends). This should be alternative to a chronological order. Just another view. 6. I would love to see a visual social graph on twitter – a static connection graph and a dynamic one based on active conversations. 7. I definitely would like a better search engine. Since I am dreaming, I may as well ask for one with better contextual and semantic search. This keyword search does not do it for me. I have a few more (a template tweet for conferences for example), but will keep it as material for another post. What are your wish list items? There are several cool and extremely useful extensions to SMW like Semantic Forms, Halo etc. I know this is a very short summary, but I hope to come back and gush about how cool SMW is someday after I use it for a while. Right now, I am thinking of using it for the following. 1. For a new public website we are creating. The advantage of using a wiki for a website are many. You can make portions of website protected so that no one can change it. But open up other portions of your website for community participation. You get a lot of benefits. Easy content management, templates, category pages, built in search, automatic revision control, easy editing. With SMW you get a few more features like semantic annotations, easy publishing of machine readable data. To me the most exciting part is the ability to dip my toes in the semantic web technology which will change the web experience dramatically over the next few years. I have a tried a couple of learning portals with pbwiki (now called pbworks) and am very happy with the experiment. Pbworks folks are great in terms of support, make it easy to create wikis and maintain it and even provide some nice wysywig tools for editing. Now I want to go to the next step and figure out how we can use some of the capabilities of a semantic wiki to build collaborative learning spaces (lekis). We already use a wiki as an internal knowledge base for projects, resources and managing project logs and learn logs. There is a lot of content that can benefit from more structure and easy reuse across our website and internal wiki. We also want to build a few bots that do some of the more mundane work for us. For example extract information from project log and add it to internal timesheets. Another would be to crawl requests for changes both internally and externally and create list views. For example, I can write in my project log that it would be nice to support this feature and annotate it so that it automatically becomes part of a feature list. Ever since we started using a wiki internally, our need for using products like Word or Google Documents has come down dramatically. Since micro documents by nature are small pieces of text (often a page), lists and links, we start off incrementally building them. Often we just start with an intent expressed in title and some todo items in a page and come back to fill it later. Creating a document like this is way more satisfying and lot easier. I have been giving this talk for a while and have been adding to the slides. I just found out that there is whole book on where good ideas come from. I just got the book and before I read it, I wanted to get this post out so that I can compare with what I learn. If you pick Challenges, some one has already done the work for us. 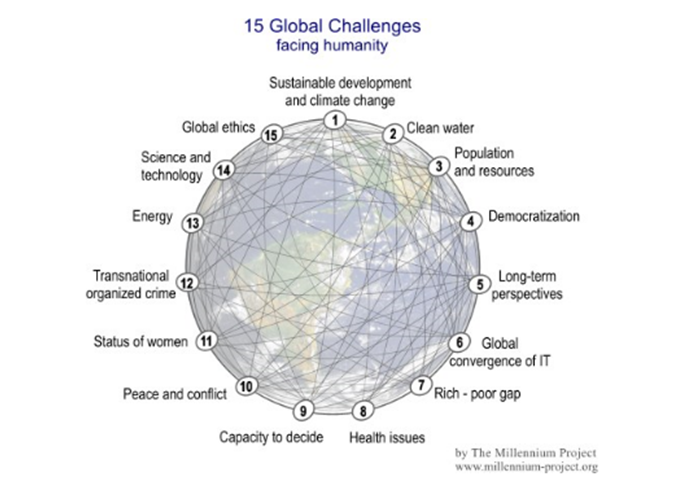 Here are the 15 Global Challenges facing humanity, identified by The Millenium Project. Even if you make a fractional improvement through one of your ideas in any one of these areas, we are off to a good start. 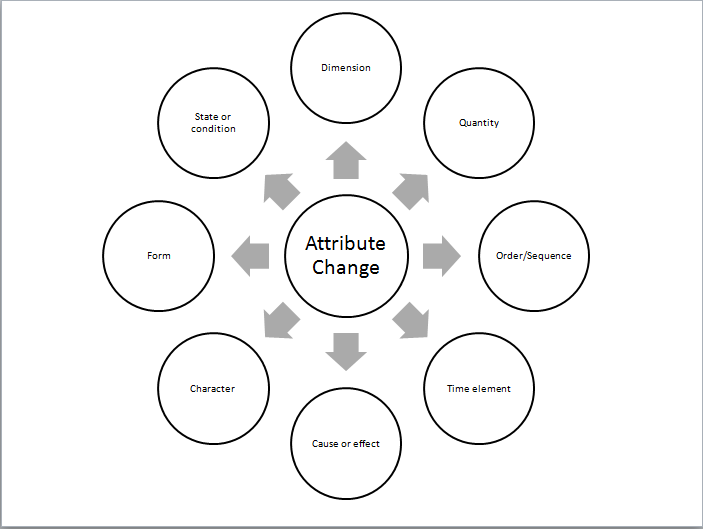 Changing one or more attributes of an existing product or service (courtesy J.K.Iyer of LIBA – Loyola Institute of Business Administration). Here are some questions for you to think about. What is the difference between discovery, invention, ideas and innovation? What is the simplest tool you can use to set up an informal innovation framework in your group or workplace? What is Open Innovation and why should you pay attention to it? What is the effect of Social Networks, the wider web on global innovation? How can you stay current on the innovation taking place in your industry or more specifically in your products? How can you leverage incremental innovation to improve your products and services? 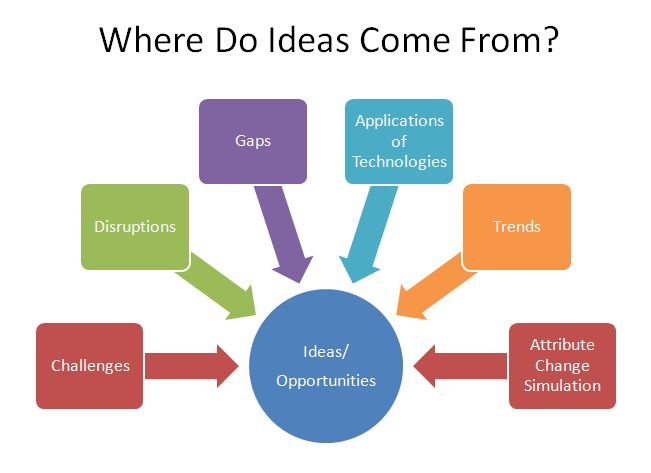 Do you have other ideas about where ideas come from? Please feel free to share them in the comments section. Posted on October 12, 2010 Categories Ideas, Creativity, Innovation6 Comments on Where Do Ideas Come From? I started thinking about it as a connection graph. While a social graph builds social connections and influence, a connection graph is both more generic and more specific. Here are some examples. I am connected to over 400+ friends on Facebook. Yet I interact with only a small subset socially and even a smaller subset for recommendations (both giving and taking). The recommendation relationship is a bit asymmetric. While I give advice on startups, I take advice about almost everything else. On Twitter, I follow over 3000 people and a similar count follows me back. However, my daily reading list is a small subset of these people and the ones I refer and recommend (through retweets) are even a smaller subset. So here is the challenge. How do you keep all these connection graphs in sync? How do you make sure that when you want to communicate something, it goes to the right people without spamming all the others? Once in a while I look at the top 20 search terms on my blog. I need to correlate it with the most read posts. This combo tells me a lot about what I need to focus on in future posts. What If Startups Were Your Target Market? Their challenges may span a wide spectrum – generating ideas, validating ideas, building prototypes, finding initial customers, finding early adopters/evangelists, getting funding (through angels initially and VCs later), validating products, finding good business models etc. What if you can really help them in the areas that make a huge difference? I would count services that helps startups as thick value, since these startups, even when they are moderately successful, will create economic value. Posted on October 11, 2010 Categories Startups and Entrepreneurship3 Comments on What If Startups Were Your Target Market? Just too good of an information fragment to pass up! I got pretty excited and started trying a few queries on my own and quickly found some limitations. You can try them too. But it is fascinating to see how these queries work. It would be fun to try these queries in other popular search engines (they come nowhere close). Let us imagine a world where search engines see queries the way you do and can get you answers. Won’t it make secondary research a lot easier?